Nadler is a luxury boutique concept and self–rated 4 star brand. Offering all the luxuries that make your stay memorable, comfortable and enjoyable but stripping out some things you may or may not think essential. These include facilities such as restaurant, bar and gym that you may expect of a 4 star hotel. We think the concept works because the Nadler Soho has proved very popular with guests who love the modern amenities, feel and location with lower rates than you would expect for the area. While the hotel does not have its own restaurant it makes up for this by supplying every bedroom with a kitchenette consisting of cutlery, crockery, microwave, Nespresso coffee maker and a small fridge. Guests can also order takeaways from nearby partners of the hotel. Additionally in the reception area are vending and ice machines. All guest rooms have complimentary wireless internet access (wired Ethernet access available for a charge). They also come with a pillow menu, work desk with power points, laptop sized safe, usb charger and European adapter, top brand hairdryer, direct dial telephone, extra luggage storage under bed, flat screen TV (with local directory and information), free toiletries and individually controlled heating and cooling. You also get free national calls. Bathrooms have either a bath with high–pressure shower, an oversized high–pressure shower or a wet room. Also some bathrooms have speakers that are connected to the television. All rooms have a daily maid service, 300 thread–count luxury linen and 500g cotton towels. All rooms except the Soho singles have a Britta water filter. All rooms except the standard rooms have a Nespresso coffee machine. Deluxe rooms come with bathrobes and sippers. Alcohol and soft drinks are served in the pantry. The reception is open 24 hours (also provides luggage storage), the local ambassador conceriege service is also 24 hours. Other services include same day collection and delivery of laundry and dry–cleaning, baby cots on request, concierge, ironing service, lift to all floors. Please note the Nadler Hotel is fully non–smoking. The hotel features specially commissioned original art works in reception and bedrooms. An innovative facility is the Nadler Arrival/Departure Base service where for a small charge guests can freshen up before check–in or after check–out. This is actually one of the single bedrooms and all its facilities. A well equipped meeting room for up to 8 delegates is available for hire on the ground floor. Nearest: Tube Station: Tottenham Court Road 0.2 miles (0.3 km), Railway Station: London Charing Cross 0.6 miles (1 km), DLR Station: Tower Gateway 2.6 miles (4.2 km), Motorway: M1 Junction 1 5.7 miles (9.2 km). This hotel boasts 7 tube stations with a half mile radius (0.8 km). The Nadler Soho sits in the heart of Soho which means a privileged location amongst the main central tourist areas. It benefits from having a good range of small restaurants, bars and cafes on its doorstep. Soho is one of the main areas for nightlife, known across the world for its clubs, restaurants and adult oriented entertainment. It is also home to many company headquarters including several in the media and film world. On the south side of Soho sits Chintown (400 yards away), a very Chinese area especially for Chinese restaurants and always popular with tourists. The Nadler hotel is only 150 yards south of Oxford Street (3 minutes walk), one of the busiest shopping streets in all of Europe with a whole range of stores, from the largest to small boutiques, and stretching nearly a mile and half. 400 yards from Covent Garden and its famous Piazza and street artists. Despite being within a heartbeat of the busiest areas of London the hotel is in a quiet side street. The nearest tube stop is Tottenham Court Road at 0.2 miles (0.3 km) but there are 6 tube stations within half a mile. You will also not have any problems finding a black taxi in the surrounding areas. The hotel is on the west side of Carlisle Street while the east side of the street is opposite the lovely area of green in the middle of Soho Square. Nearest places of interest include Ben Uri Art Society and London Jewish Museum (0.05 miles), Ripleys Believe it or Not Museum (0.3 miles), Leicester Square (0.3 miles) and the Political Cartoon gallery (0.3 miles). Milesfaster ranking: 18th from 866 London hotels, and 5th of 328 four star rated hotels. Another to Consider: Another hotel that is much like the The Nadler Soho and not too far away (0.2 miles, 0.3 km) would be the 4 star The Piccadilly London West End, where prices begin from around £153 and which has a 91% guest satisfaction rating. The Piccadilly London West End also offers: free WiFi. For a hotel that offers lower base rates take a look at the Rathbone Hotel. 0.3 miles away (0.5 km), has been rated at 82% by past guests and the hotels starting rates begin at about £79. Why not choose a hotel with a higher customer satisfaction score? If that is what your after then the 5 Star Marriott Grand Residences Mayfair is potentially a good choice for you, it's only 0.9 miles (1.5 km) from here. The Marriott Grand Residences Mayfair has a perfect unblemished customer rating 100%, a truly stunning achievement. 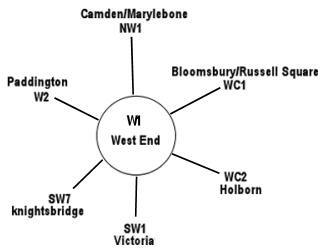 The 50 hotels nearest to this location (10 Carlisle Street, W1 postcode) that we list cover a 0.5 miles (0.9 km) radius. They include 19 five star hotels (average rating 88%), 21 four star hotels (average rating 85%), 8 three star hotels (average rating 82%) and 2 two star hotels (average rating 66%). Top 4 star hotel is The Nadler Soho (this hotel) at 96%. Of these local hotels the highest rated are Soho Hotel (5 star), the Covent Garden Hotel (5 star) and also the Haymarket Hotel (5 star) (all joint top with 99%). Base Rates: See a breakdown of the average starting (base) rates for the area. Base rates are a rough guide to starting rates as they do not include special offers and deals. The average starting rates for the surrounding area are around £179 per night. They range from a low of £18 at SoHostel (2 Star, 80%) to a high of £475 at Rocco Forte Brown's Hotel (5 Star, 90%). The breakdown by star rating shows the following averages: Five Star average: £287, Four Star average: £127, Three Star average: £98 and Two Star average: £36. Our in-house ranking based on guest ratings but adjusted for influencing factors ranks The Nadler Soho 4th of the 50 local hotels and 1st for the 21 four star hotels in the area. 28th of 50 (19th of 21 four star hotels.) for base rates ranking. Scoring the hotels rates and review score together we rank the hotel 6th of 47 when judging value for money (SoHostel was top).